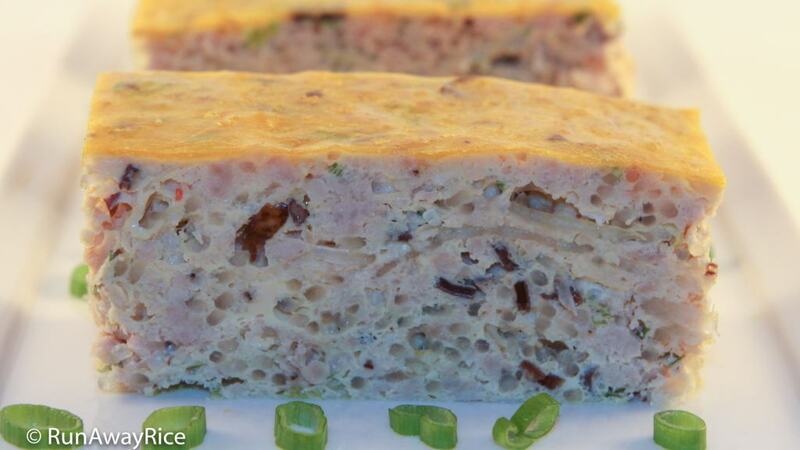 Here’s a simple, no-fail recipe for Vietnamese Egg Meatloaf (Cha Trung), often called Egg Cake. In this recipe twist, I show you how to bake the meatloaf instead of steaming it. It’s really easy and the Egg Meatloaf comes out moist and delicious. 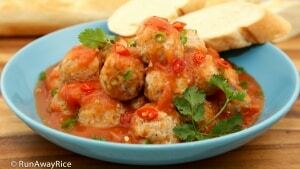 By the way, this meat mixture is really versatile and used as a filling in many Vietnamese dishes from egg rolls and dumplings to stuffed bitter melon and meat pies. Learn this easy recipe and it will be one you use again and again. Enjoy! Soak the bean thread noodles and black fungus slivers in warm water for 10 minutes. Drain the noodles and fungus and set aside in separate bowls. Drain the canned crab meat using a sieve. Gently press the crab meat with a spoon to remove the excess liquid. Chop the noodles, fungus, onion and scallions. In a large bowl, add the noodles, fungus, crab meat, onion, scallions, ground pork, garlic, vegetable oil, fish sauce, oyster sauce and ground black pepper. Add 5 whole eggs. For the remaining 2 eggs, separate the yolks and set aside in a small bowl. Add the egg whites to the meat mixture. Combine the meat mixture, blending all ingredients well. Preheat the oven to 400 F (204 C). Spray non-stick cooking spray into an 8 inch by 8 inch baking dish and place inside a 13 inch by 9 inch baking dish. Place the meat mixture into the smaller baking dish and distribute evenly in the dish. Fill the larger baking dish halfway with boiling water. Bake the meatloaf for 45 minutes. Check for doneness by inserting a toothpick into the center of the meatloaf. It should come out clean. If the toothpick is wet, bake for another 5 minutes and check again for doneness. Take the yolks set aside earlier and using a small brush, coat the top of the meatloaf with the egg yolks. Turn off the oven. Return the meatloaf to the oven and bake for another 5 minutes with the oven door open. Do not close the oven door. This will cause the egg yolk topping to turn white and you won’t get the beautiful yellow layer. 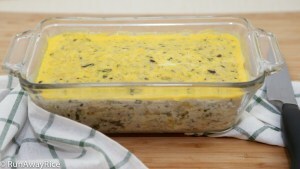 Serve the Egg Meatloaf with your favorite rice plate. Refrigerate any remaining meatloaf and enjoy within the week. Thanks for the recipe Trang! Can I omit the fungus and substitute bean noodles with vermicelli thread noodles instead? Also, is it ok if I don’t leave the oven open at the end? Yes you can omit the fungus and substitute with the vermicelli thread noodles. Closing the oven door is just fine. The egg yolk may turn white but it’s just the color and has no effect on the taste. Enjoy the recipe! This tastes amazing and so easy. Just like my grandma used to make. Thank you so much for this recipe. It means the world to me. Aww…your comments makes me so happy! I am so glad you enjoyed the recipe! 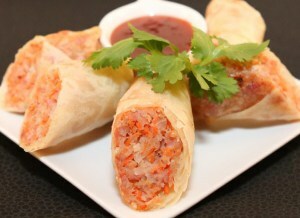 hello Trang this is awesome Thank you for your sharing…..
My pleasure Tony! I am really glad you like this! 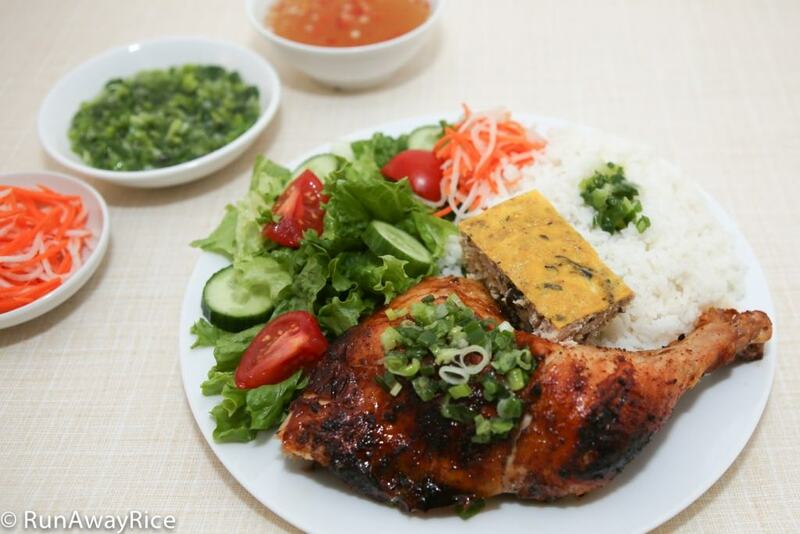 Ever since having it in a Vietnamese restaurant, I’ve been dying to find a recipe. I’m thrilled that I can bake this in the oven. Just one question : if I can’t find any crab meat, would you suggest imitation crab (or will that add too much sugar) ? How much would I need for your recipe above ? I will try to get the real thing, though. Thanks again for sharing ! Imitation crab meat is just fine and I don’t think it will make the egg meatloaf sweet. Use approximately 4 ounces of the imitation crab meat in the recipe. Enjoy the recipe and stop back to let me know this turns out for you! We just made this tonight however it came out with a lot of water and its not hard enough. Is there a reason why? Is it possible some of the water from the water bath got into the meatloaf? Such an easy to cook dish, just cooked it for dinner tonight, my kids said so yummy. Thank you for sharing Trang. I am glad you and the kids enjoyed this easy recipe. It’s a favorite busy-day dish at my house.